The Fermi acceleration mechanism at shocks is invoked to explain non-thermal cosmic-rays in Supernova Remnants, Active Galactic Nuclei Jets and Gamma ray Bursts. 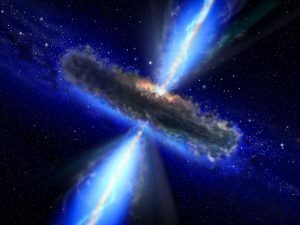 The importance of achieving the highest observed cosmic-ray energies by such a mechanism in extragalactic astrophysical environments is a recurring theme. Moreover, relativistic shocks, either single or multiple, have been inferred by observations to be forming within a high-speed plasma jet in extragalactic, relativistic sources. The acceleration of cosmic-rays via the Fermi acceleration mechanism in these shocks is believed to be responsible for the observed cosmic-ray power-law distributions and consequently for the radiation of gamma-rays and neutrinos. In this talk, I will focus on the relativistic cosmic-ray shock acceleration mechanism by giving an overview, will present Monte Carlo test-particle simulation studies for relativistic single and multiple shocks, and will briefly discuss the secondary production and extragalactic propagation of the accelerated high-energy cosmic-rays, giving some insights of their relevance to a multi-messenger physics approach.